Having a game called off due to Mother Nature is always frustrating - but travelling half the length of the country and turning up at the ground before the decision is made is even worse. We trained as normal on Friday morning before our 418-mile round trip to Accrington, knowing full well that rain was due 'up north'. But I didn't think about the possibility of the game being postponed because as soon as you do, your preparation suffers. We set off up the M40 and proceeded to hit all the usual Friday afternoon traffic, so we had a quick stop off at Keele services to stretch the legs and pick up some snacks. Once at the hotel, I had some dinner and a swim before bed, still hoping that all the weather forecasts we kept watching were going to be wrong. As all parents will know, my body clock is set to the precise time that my daughter wakes up every morning, but I decided that seven am was too early for breakfast on a match day and managed to doze for an hour before heading down at eight o'clock, leaving my room-mate Sam Wood to sleep on in peace. The gaffer, Gareth Ainsworth, set off to the ground before us to look at the pitch so we missed our usual team meeting at the hotel. We were all following the Twitter updates from the official Accrington account and although the game was still on, the wording made us doubt whether any football would be played. When we got to the ground and saw the puddles starting to form on the pitch, it was obvious there was no way we were going to be able to get a game on. Our kit man told me that an hour before we got there the pitch was still playable, but the sheer volume of rain had made the groundstaff's job of keeping the pitch in a playable condition impossible. 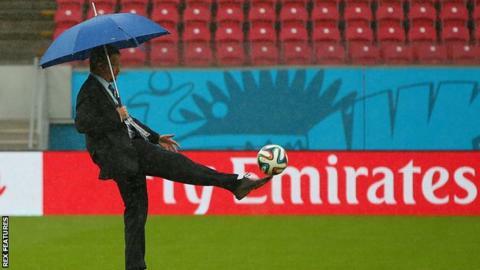 In that situation, you feel absolutely gutted that the game is off. All the preparation, the travel, the opportunity to pick up points is gone. We had a bit of fun at the kit-man's expense after he laid out all our kit and boots and then had to pack it all up again. Then we felt bad and helped him before we jumped back on the coach. It was so disappointing to hear about our supporters who had spent money and time on travelling up to Accrington only to have to jump straight back in the car and head home with the prospect of repeating the trip on a Tuesday after work. Like all football fans, our supporters spend a lot of money following us and we all really felt for them. Luckily, the hotel we stayed in on the outskirts of Bury had a sizeable gym so we went straight back there, having only left around an hour or so previously. Our fitness coach set up three stations. Cardio work on the bikes, upper body including some core work, and a lower leg circuit. Some lads, including myself, love the gym and actually enjoy these kinds of sessions whilst others dislike the gym and find it a chore, but we all got the work done before jumping back on the coach, which now felt like our second home. The journey home was weird as we weren't buzzing about picking up three points or agonising over a defeat; they're the two usual extremes on the coach journey home from games. Back to the training ground just before eight pm, there was nothing else to do except go home and watch the boxing.